TACOMA — The No. 1 seed can no longer finish No. 1. The Union Titans still want to finish strong, though. The Curtis Vikings scored the game’s final seven points, stunning the Titans 58-55 in the Class 4A state boys basketball tournament quarterfinals in the Tacoma Dome. They will fight, only they will be fighting in the morning, the dreaded breakfast club of the double-elimination tournament. Union will take on Puyallup at 9 a.m. in the fourth-place semifinals. The Titans wanted to be in the championship semis, of course, but turnovers did them in Thursday against Curtis. Conley said the goal for the Titans is 10 turnovers or less for a game. The Titans had 13 in the second half against the Vikings, 19 total. Curtis led for much of the first half, but the Titans would gain the edge just before halftime and maintain that lead 1:38 left in the game. Jordan Parker’s three-point play gave Curtis a 54-53 lead. Another turnover led to a Curtis basket and a three-point advantage. Zack Paulsen led the Vikings with 22 points. Houston Combs would score for Union with 8 seconds left to make it a one-point game again. The Titans fouled. The Vikings converted. Union’s last-second 3-pointer fell short. Union, No. 1 in the WIAA’s RPI coming into the tournament, fell to 24-2 this season. Ethan Smith led Union with 18 points. Brad Lackey made four 3-pointers and finished with 16 points. Lackey’s 3-pointer to open the fourth quarter gave the Titans a six-point lead. Then those turnovers proved costly. “It was uncharacteristic,” Conley said. “We just didn’t make plays down the stretch. It wasn’t for lack of effort by our guys,” Conley said. He expects another strong effort Friday in the consolation bracket. 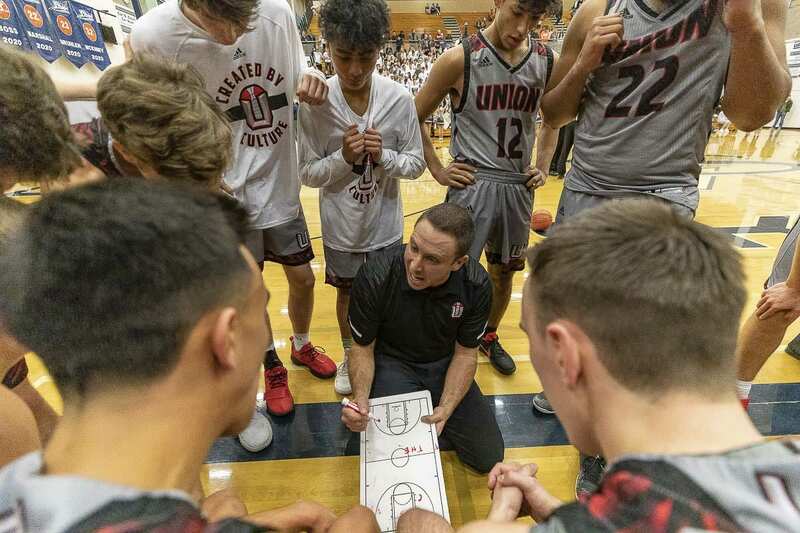 A win Friday will assure Union of a trophy at state, a spot into the fourth-place game Saturday.